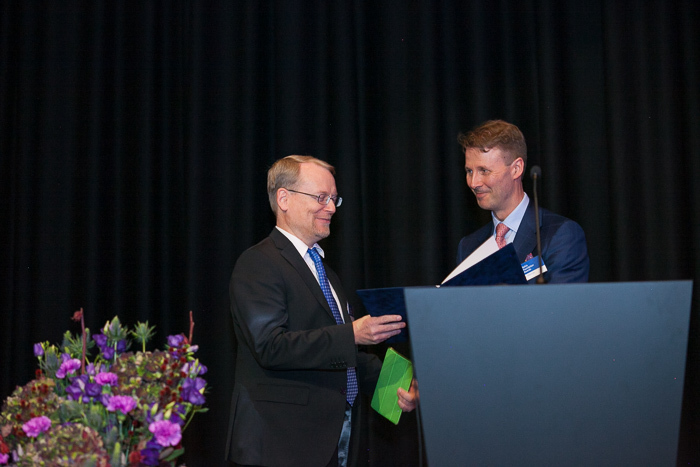 Chairman of the Nokia Board Risto Siilasmaa presenting the Diploma to Jari Arkko in the Nokia Foundation Awards Ceremony. For the great contributions to the advancement of the Internet and its technologies and applications during the last 20 years, as well as for your leadership in the global Internet standardization as the chairman of the Internet Engineering Task Force since 2013. You are known as a pioneer in the development of the Internet Protocol version 6, the Mobile Internet and Internet security including your work for the open and community driven Internet of Things. You are leading by example and you represent the best values of the Information and Communications Technologies of Finland.